Breakfast At Tiffany’s. A Short Novel and Three Stories. New York: Random House, 1958. First edition of Capote’s seductive, wistful masterpiece. Octavo, original cloth. Signed by Truman Capote on the half- title page. A fine copy in an excellent dust jacket that shows some light toning to the spine and rubbing to crown. Jacket design by Ismar David. Housed in a custom half morocco clamshell box. "Truman Capote is the most perfect writer of my generation. He writes the best sentences word for word, rhythm upon rhythm. If you want to capture a period in New York, no other book has done it so well. He could capture period and place like few others" (Norman Mailer). The film adaptation was directed by Blake Edwards, starring Audrey Hepburn and George Peppard. First edition of Capote’s seductive, wistful masterpiece. Octavo, original cloth. 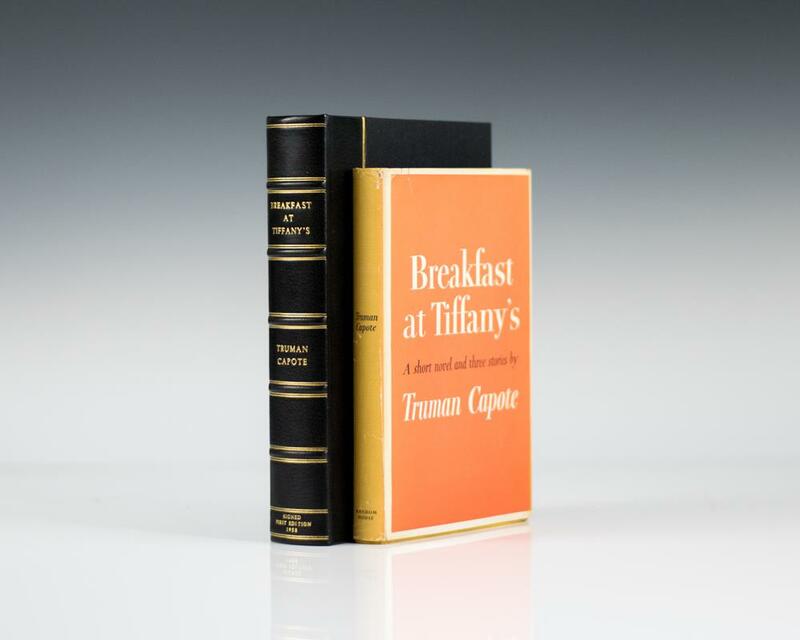 Presentation copy, inscribed by the author on the front free endpaper, “For Albert J. Raman good wishes Truman Capote.” The recipient was an attorney and well-known book collector. Fine in a near fine dust jacket. Jacket design by Ismar David. Housed in a custom half morocco clamshell box. A very nice example. First edition. Octavo, finely rebound in full black morocco. Signed by Truman Capote on the title page. Titles to the spine in gilt, gilt ruled to the front and rear panels, raised bands, all edges gilt. A very attractive example. Signed limited first edition of Capote’s landmark non-fiction novel, one of 500 numbered copies, this is number 495. Octavo, original cloth. Signed by Truman Capote. Fine in the original acetate, original slipcase. First edition of Capote’s landmark non-fiction novel. Octavo, original cloth. Signed by Truman Capote on a tipped in page. Fine in a near fine dust jacket with some light rubbing to the extremities. Jacket design by S. Neil Fujita. New York: The New Yorker Magazine, 1965. Four issues of the New Yorker of Capote’s In Cold Blood, which is where it was originally published. Octavo, bound in half cloth. 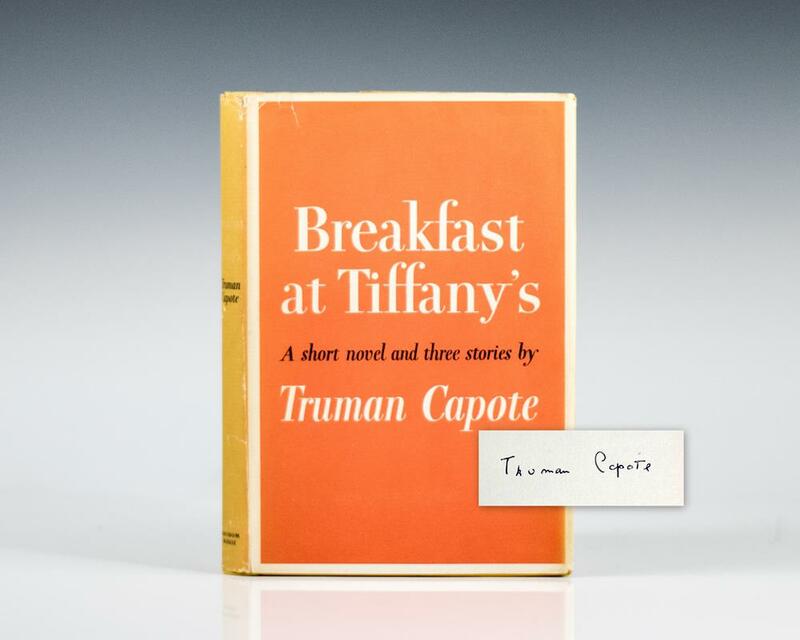 Signed by Truman Capote. In near fine condition. Rare and desirable. 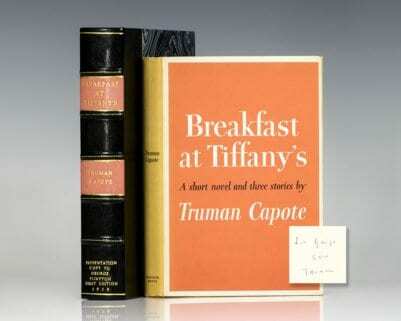 First edition of Capote’s landmark non-fiction novel. Octavo, original cloth. Signed by Truman Capote on a tipped in page. Fine in a very good dust jacket with some light rubbing to the extremities. Jacket design by S. Neil Fujita. First edition of Capote’s seductive, wistful masterpiece. Octavo, original cloth. Inscribed by the author on the front free endpaper to George Plimpton, “For George Love Truman.” Capote and Plimpton became close friends in the early 1950’s in Brooklyn Heights, New York. In 1953 Plimpton became editor of the Paris Review, known for its signature lengthy, tape-recorded oral interviews. Upon the publication of Capote’s In Cold Blood in 1966 he produced The Story Behind a Nonfiction Novel, a detailed and intimate portrait of Capote and the story behind his latest work. Plimpton later published a full-length biography in 1997, Truman Capote: In Which Various Friends, Enemies, Acquaintances and Detractors Recall His Turbulent Career, that combined the voices of some of Capote’s closest friends and colleagues into a telling portrait of the iconic author, reminiscent of his quintessential portrait of New York: Breakfast at Tiffany’s. Fine in a near fine dust jacket with light toning and wear. Jacket design by Ismar David. An extraordinary association copy.